Gap Girl- I'm not even sure how I found her blog, but I love reading it. 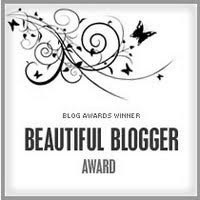 She has a beautiful family, and this beautiful blog award definitely fits. The Four Farrells I got Jessica to start a blog a year ago, when we the kids played soccer and she stuck with it. I love reading her blog. Random Thoughts & Dirty Laundry- Well lets see I have "known" Anna for 3+ years through a website and in Nov. we actually met during the MckMama gathering. How funny. She introduced me to cloth diapering. I love Anna's blog, she stands her ground on what she believes in and I admire her for that. 2 boys & A Little Lady I like reading this blog, she has the cutest little girl. And now pregnant again w/ #4. I wonder if she's going to change her blog to 3 boys & A little Lady or 2 boys & 2 little ladies. Guess I will have to wait & see. Arizona Momma- I found this blog through the MckForum. I love reading this one too. Her little boy Colton is just the cutest! Now 7 things about myself. See thats hard. Why do I find it hard to come up with 7 things about ME! 1. I never wanted to get married, and have kids. How crazy is that? 2. I was a bully in school. Always in ISS. And skipped school alot. 3. I wore braces twice for 2 years each, I will have straight teeth damn it! 4. I'm very outspoken, right honey? 5. I'm addicted to coupons. I love saving money. I am going to do a post about my couponing addiction.